1. Chop the meat into medium chucks and brown. Season with garlic, peppers, onion, salt, cumin and black pepper. Cover with water and simmer for 2-3 hours. Then separate the meat from the broth and shred it. Set the broth aside. 2. Cook the rice. Boil the potatoes until soft and cut into cubes. 3. Add 1 tablespoon salt, 1 teaspoon ground cumin and 1 teaspoon ground achiote to the dry corn flour and mix. Add vegetable oil and broth. Mix with hands to make a dough. This is called the “masa”. 4. Cut off the middle vein from leaves, briefly pass the remaining leaves over a flame to slightly smoke them. With your hands, cut the banana leaves into squares. Spread 3-4 tablespoons of masa in the center and fill with potatoes, rice, meat, 2-3 raisins, and any other extra ingredients that you choose. For example you may add 1-2 olives, 4-5 capers, 1 prune, a tomato slice, black bean puree, to make a nice compliment. 5. Fold the banana leaves and tie with a natural fiber string called “pabilo” or with a cotton string. 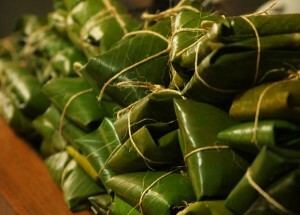 Then tie the tamales in pairs into “piñas”, leaving the foldings of the leaves on the inside of the “piñas”. 6. Cook the tamales in gently boiling water for one hour.